With an authentic heritage that is hard to beat, Barbour Knitwear is crafted from only the finest fabrics for designs that are touchably soft and offer incredible form...plush cashmere, cosy lambswool and spun cotton are just a few of the many textiles that are utilised for an always elegant finish. Garments easily transcend between seasons so whether you're keeping the icy chill at bay or lightly covering up in a cool breeze on a balmy summer's night - we have something for everybody and every occasion. Individual collection stories from nautical influences through to the classic tartan inspiration and the magic of nature that surrounds us - items bring an alluring edge with pretty button front cardigans, chunky cable knits, robust heavy-duty sweaters and lightweight cover-ups that will take you from day to night effortlessly. Discover the luxury of Barbour knitwear with our exclusive collection for both men and women. Barbour have a long standing reputation for creating signature designs from the most luxurious of fabrics - and this extends through to their incredible knitwear selection for men and women. From heavily structured weaves to the softest, lightest Merino - the quality is unsurpassable, with the comfort factor sitting at the top alongside the style credentials. With basic knits that will see you through each season in style, through to contemporary designs that showcase the latest trends and colour palettes - there is something to suit every occasion and more. Delicate necklines meet chunky roll necks, whilst ribbed panelling competes with pretty button cardigans and cable knit structures. Sturdy and robust or feminine and light - our selection of Barbour knitwear is extensive and highly desirable, working seamlessly with your capsule wardrobe to create sophisticated ensembles for work and play. Create a stylish look with layers and explore our versatile collection of Barbour cardigans. 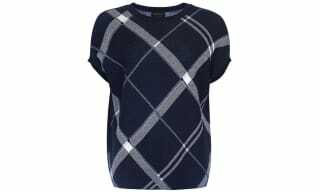 Perfect for wearing loosely over other garments or wrapping up in cooler temperatures, a classic cardigan whether traditional or high-fashion is a wardrobe must for all. Barbour are the country connoisseurs - radiating luxury country style with every thread. Chunky knit cardigans with shawl necks and robust structures are perfect for wrapping up, whilst delicate button fronted styles with feminine detailing and pocket set ups are ideal for warmer days when only a light but stylish layer is required. A successful fusion of sporty aesthetics and stylish accents, our incredible collection of Barbour half zip jumpers will bring a signature accent to your casual wear wardrobe. 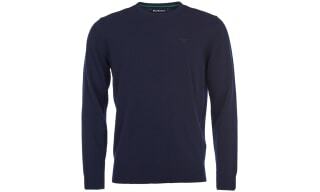 With key designs for both men and women, this array of desirable sweatshirts and jumpers will see you through every season with easy transition, always radiating Barbour's classic heritage and refined finish. 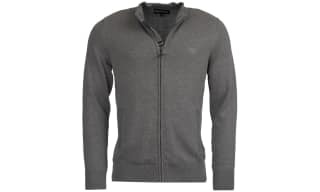 The half zip detail is a long standing style statement, executed in a sporty demeanour for a relaxed off-duty piece of attire. 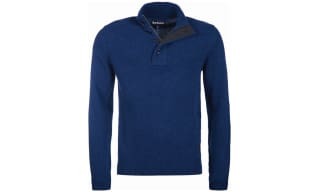 With versatility at its very core, a Barbour half zip jumper can be worn with a plethora of garments to a for a multitude of occasions; whether you're shooting in the field, going out for a walk, heading into town, or simply relaxing - you can team this functional style with t-shirts and long sleeved tops under a gilet or heavy duty jacket. Layer up for cold-weather outings or take as a cover up for when the temperatures drop slightly. 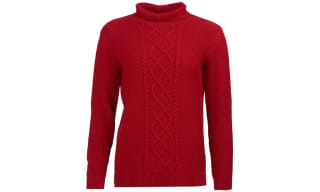 The zip neck design is a superb feature, both flattering to wear whilst offering protection. Whether it's a relaxed off-duty weekend or day at the office, explore our immaculate collection of Barbour v neck jumpers for an essentially versatile piece for your wardrobe. 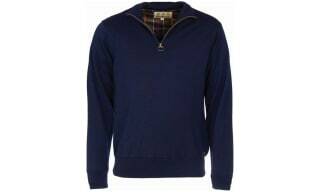 Utilising luxurious textiles from the softest Merino wool to touchably soft and breathable cotton, Barbour have created a highly desirable range of must have jumpers that ooze quality and expert design. 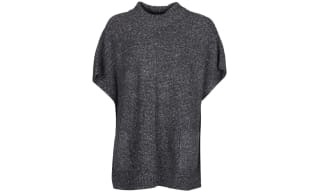 From morning until night, a v neck is a sure fire way to channel style and sophistication - be it layered over a crisp cotton shirt for work hours or teamed with a t-shirt or blouse for a stylish event or day out. 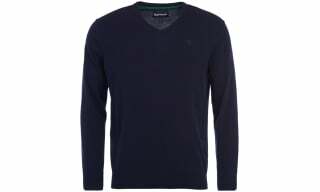 Chinos, jeans , skirts and shorts - you name it and you can throw on a luxury Barbour v neck to complete your ensemble. 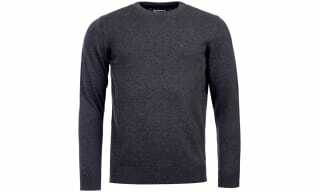 The specially cut neckline is a flattering detail, drawing the eye in and creating a superb silhouette with great form. 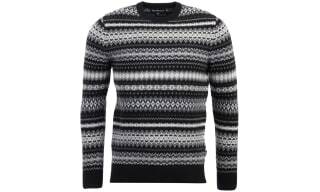 Featuring iconic patterns and prints that sit wonderfully next to simple block colours, Barbour know knitwear and know it well. 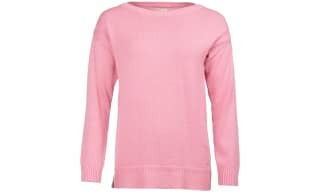 Indulge in sheer, simple style with our collection of Barbour crew neck jumpers and sweaters. We boast a range of designs that are ideal for ladies and gentlemen of every age - so whatever you need, you’re sure to find it here. Beautifully created from a plethora of sublime fabrics including cashmere and lambswool; you definitely can’t go wrong with our ever growing collection from the masters of heritage design and craftsmanship. Featuring an array of desirable designs, inspiration is taken from their latest collection stories; with a wealth of patterns, prints, and textures to choose from. Nautical stripes and bold winter fairisles sit with statement camouflage, pretty florals, back to nature imagery, chunky cable knits, and much, much more. 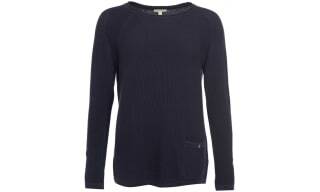 Cut a flattering figure in our classic and trend-led collection of Barbour scoop o-neck jumpers. With a bountiful range of versatile items for the choosing, you'll be kitted for every possible event in true style. 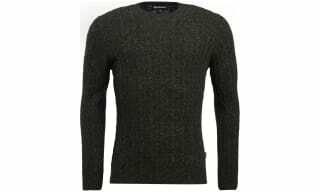 The classic sweater is a wardrobe staple, a practical yet always stylish piece that will work for any season either layered up or worn as a single piece. The beauty of our scoop and o-neck designs is their ultra-flattering necklines that provide an enhancing look for your day to day style. From chunky cable knits and woven wools to lightweight jerseys and bold printed numbers, whatever your personal preference we're sure to cater for all of your needs. The classic heritage inspired country charm of Barbour is not one to miss when it comes to investing in your layers, their expertise and use of the highest quality fabrics ins unrivalled, discover their inimitable style for yourself. 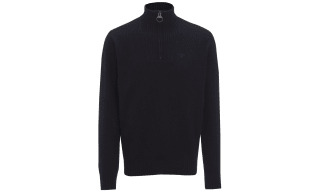 Keep the chill at bay in a classic Barbour roll neck sweater. The cosy but stylish design has been a popular winter warmer for many years, perfect with your cold weather cover ups for a style-laden outfit.